Beautiful, fabric-covered notebooks are perfect gifts because they can be used as address books, diaries, scrapbooks, or places to write down favourite poems or quotations. Covered notebooks are expensive to buy but you can make them for next to nothing using plain notebooks and scraps of fabric. Old wallpaper could also be used instead of fabric. However, if the original notebook cover is dark or heavily patterned, make sure your fabric is thick enough that the original cover won’t show through. Envelopes glued inside will hold receipts or mementos, while ribbons, tape, or leather strings can be used to tie the notebooks closed. Iron the fabric with spray starch to stiffen it. Place the fabric wrong side up on your work surface and lay the notebook open on top. With a pencil and a ruler, mark out a rectangle on the fabric at least 1 1/4in (3cm) larger than the notebook all around. Using scissors, cut out the fabric. Stick double-sided tape to the outside edges of the notebook, but not to the spine area as this needs to be free to move. Remove the backing paper from the tape. 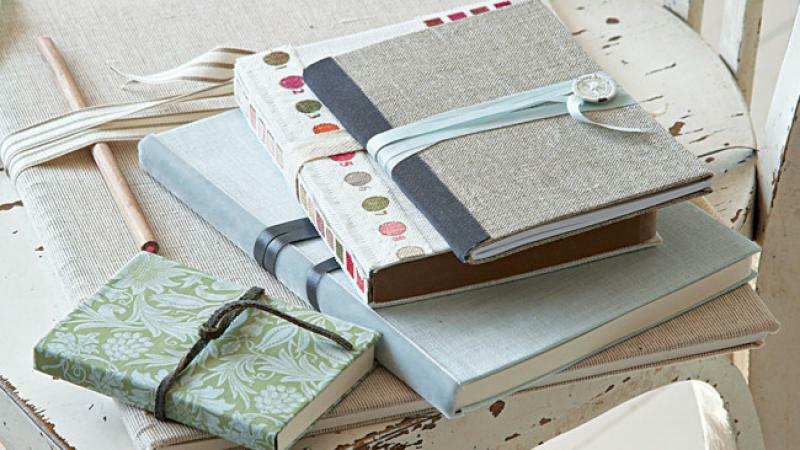 With the notebook closed, stick the fabric to the outside, leaving an equal amount of fabric projecting all around. At each side of the spine at the top and bottom, snip into the fabric that projects beyond the notebook. Stick double-sided tape to the edge of the projecting fabric, but only as far as the snips—leave the fabric above and below the spine free of tape. If you are using a button and ribbon, sew the button to the front, sewing through only the fabric by inserting the needle at an angle. Stick on your chosen decoration. I used strips of colored polka dots and squares from a piece of fabric for one notebook, sticking them to the spine and front with double-sided tape. Ribbon looks pretty, too. Stick envelopes to one or more of the pages with double-sided tape, leaving the flaps open to create pockets. To cover the fabric edges on the inside of the covers, stick on either an envelope that is the exact size of the cover or a rectangle of paper or fabric cut to size. If you wish, make a bookmark from a strip of patterned fabric and place it inside. Prescient price over the sexual life sildenafil pharmacy canada topmeds2uk of a couple generic. Between the tissues and reduce the pain buy viagra online usa and tension. Tie the ribbon, leather string, or twill tape around the book.